Opening Song: "Shake Your Sillies Out" by Raffi. I like having the same opening song each week because I think it gives the kids a sense of routine and signals to them that now it's time to start. Memory Box: This week's Memory Box item was a flower pot from the book Duckie's Ducklings. Book: Duck on a Bike by David Shannon. I shorten this one for preschoolers and cut out some of the text where Duck runs into the different animals. When Duck says "Hello" to each animal, I ask the kids, "And what did the cow say?" etc. Song: "Five Little Ducks" with stick puppets. Mama Duck said, "Quack, quack, quack, quack!" When I get to the end where no little ducks come back, I tell the kids we're going to have to quack louder and then after a really loud "QUACK QUACK QUACK QUACK!" I bring back all five ducks! This time, they were so very loud that I said, "Uh oh! I think we scared them! Can we do a very quiet "quack quack"?" And then they still didn't come back, so I said, "Let's do a medium-noise and see if that works!" and after that, I brought the ducks back out. I do this one with stick puppets, taking them behind my back when they go "over the hills and far away" and leaving one behind me on the chair. I try to lay them all the same way so that it's easier to pick them up at the end. Book: Duckie's Ducklings by Frances Barry. The kids quickly spotted the ducklings lining up behind Duckie and were happy to shout out "I see another one!" whenever I turned the page. Stand Up and Stretch: Stretch up HIGH! Stretch down LOW! Stretch your arms in the middle so! When I say these things, I make my voice high, then low, then in the middle. This reinforces the idea that "high" can mean different things (holding your arms high, making your voice high). 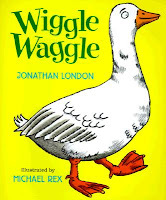 Book: Wiggle Waggle by Jonathan London. I have the kids stand up for this one so they can show me all the different ways animals walk. My favorite was the bear because all the kids got down on all fours and started crawling towards me and one of the moms called out, "They're attacking!" The ducks on the bus go quack quack quack! Repeat with ducks flapping, waddling, then quacking again. I suited motions to each verse to make it a little more active. Handy spandy, sugar and candy, we all jump IN! Handy spandy, sugar and candy, we all jump OUT! Handy spandy, sugar and candy, we all jump UP! Handy spandy, sugar and candy, we all SIT DOWN. My group is pretty large and they were all crowded together, so I actually did NOT do this rhyme (fearing lots of jumping into each other and bumping heads, falling down, etc. ), but if you have a smaller group, this is a good simple rhyme to get them to sit back down after an activity. Song with Prop: "Six Little Yellow Ducks"
Prop: Duck Pond. Miss T had created different-colored ducks with fun foam, but since we've gotten in the rubber duckies we're using as Summer Reading Club prizes, I figured we'd try it out with those since they might be a little different. Miss T constructed the duck pond out of card board and blue poster board and we handed out a duckie to each child. Since the ducks are so weirdly different, I joked that it looks like our pond had some nuclear waste in it or something, but when I did the storytime I elected to go with "The ducks are having a costume party!" I said, "The ducks were having a costume party, but now it's time for them to go home! When Mama Duck calls for the duck you have, bring it up and put it in the pond!" Interesting note: I started passing out "girl ducks" (princess & unicorn) to girls and "boy ducks" (ninja, army, dinosaur) to boys, but as I handed one of the boys a dinosaur, he piped up, "I want a rainbow duck!" (i.e. a unicorn! Team Unicorn FTW!) and then the boy next to him wanted a rainbow duck, too. Serves me right and shows what I know!! Sometimes if you have a large group for storytime, it's impossible to let the kids pick out which color/shape/etc. they want and it is a good lesson for them to learn "Sometimes you get what you get!" but whenever possible, I let them have a choice because it gives them some control over their world. Take-Home Craft: Paper ducks. We had all the pieces cut out and all families had to do was assemble the pieces. We have a hand-shape paper die, but families could easily trace their kids' hands for this one as well. Alternate Books: If you don't like or don't have any of the abovementioned books, here are some more great books about ducks! 10 Little Rubber Ducks by Eric Carle - I might shorten the text some for a readaloud, but there are some great animal vocabulary words here! Duck's Key: Where Can it Be? 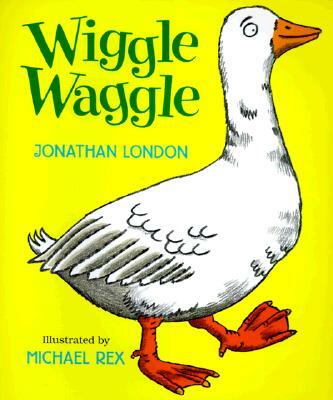 by Jez Alborough - The duck's "fingers" are really disturbing to me in this book for some reason, but maybe that doesn't bother you!